Yvette Marie Stevens, who later took the name of Chaka Khan, was born in 1953 in Illinois and grew up not far from Chicago. She made up her first band the Chrystalettes at the age of 11. Taking part in the Black Panthers' program she took the name Chaka. Since that the artist changed many musical collectives, but only after she joined Rufus band, the singer stepped on the road to fame. She also married the Rufus bassist Hassan Khan and took his surname. From 1973 to 1978, when Chaka started her solo career, the Rufus was one of the best funk groups of the decade. After leaving the band the singer recorded numerous discs and singles (some became gold and platinum), got 8 Grammies and produced many hits and the legendary soul record Ain't Nobody. Her second album featured young Whitney Houston in backgroung vocals. Chaka was highly praized by Stevie Wonder and jazz legend Betty Carter for her improvization talent. It will take a long time to enumerate all her awards and achievements. 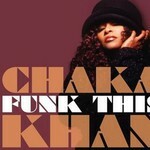 Funk This, the first album in almost a decade, is for sure one more Chaka's creation, promising to become classical. Though during her career Chaka Khan explored such musical genres as jazz, pop, disco and hip hop, on this album she decided to come back to her funk roots that brought her fame. The disc contains both covers and originals, demonstrating that Chaka is in perfect musical shape. Funk This is decorated with the covers for Pack'd My Bags and You Got The Love that Chaka originally recorded with the Rufus. The most striking interpretations are Jimy Hendrix's Castles Made Of Sand and Mary J. Blige's Disrespectful, sang by Chaka with her in the glorious duet. As for new compositions, they are all gorgeous. Angel is a pretty song, written by the artist under the impression from her taking the Christianity. Back In The Day is a wonderful retrospective composition about the times, when the R&B diva was known as Yvette Stevens and her career only began. One For All Times and Will You Love Me are tracks with extremely honest and emotional lyrics, ideally fitting for heartfelt Chaka's voice and making her talent sparkling with its adges. Funk This is the long anticipated by fans Chaka's album, although she seems even not to notice that almost a decade passed. The singer says that she was extremely busy to record: she has an active touring schedule. Besides, the artist names one more reason for such postpone. She cited the problem with recording labels. Chaka had some bad experience with recording companies in her past and wanted to be fully sure about the label before recording Funk This. It turned out that the absence of news about Chaka's releases during these years was not the silence - it was a meaningful pause. Well, Funk This managed to eliminate any hesitations about Chaka's plans for the future in musical industry, if there were any. The album has instrumentation reminding about the Rufus times, but sounds extremely fresh and colourful. It seems that at least one more R&B generation is going to witness Missis Khan's success and grow up on her albums. And Funk This is definetely going to take a respectful place among Chaka's creations.